Discovery gets to prove itself – HubNut – celebrating the average! I got the Discovery back today, after it went away for a new timing belt – needing a new water pump, thermostat and radiator in addition. It’s been very frustrating owning a car for almost a month, which I’ve barely driven. Therefore, attempting to shrug off a cold, I decided I had to get back out for a spell of greenlaning. I had missed it. I love the countryside and like to use different methods to access it. Walking is great, but so is tackling the terrain in a 4×4. Mind you, I stuck to largely easy lanes today – some of which I’ve tackled in the 2CV. I wanted to get a feel for the Discovery before tackling anything severe. The lanes of Nant-y-Moch proved ideal. They’re not far from my house and apart from one or two tricky sections – which I didn’t venture near this trip – they’re very accessible. A soft-roader wouldn’t struggle to be honest. Another reason for keeping the difficulty level low is that I was heading out on my own. I let my wife know roughly how long it should take, but you can’t guarantee mobile reception when you’re out in the wilds, and should mechanical trauma or an accident halt my progress, I could be a long way from rescue. I do like solo laning though. Heading out in big groups can be seen as very anti-social by others who love the countryside, though this is often without justification. Sadly you do get some groups who love chucking enough gear onto their 4x4s to survive a rainforest expedition, and I’ve seen plenty who love revving engines and deliberately getting stuck. There’s no need for that. If you want to play silly buggers, go and do it at a Pay and Play site. Anyway. Now I was finally away from sealed surfaces, how did the Discovery fare? Pretty good. The low ratio gears worked, and they are much lower than my previous Budget 4×4 – the Ford Maverick. This gives much better control on descents and over rocky ground. Being a diesel helps too. I only engaged the diff lock briefly for one tricky climb, but it seemed to do its thing. It took a while to disengage though – I suspect it hasn’t had a lot of use. The diff lock is on the centre differential, which allows the front and rear axles to travel at independent speeds – essential for on-road use, but not always great when off-road. The main difference compared to the Maverick is the suspension. With long-travel coil springs all-round (rather than just on the back of the Maverick, which uses torsion bars up front) and simple beam axles, the Discovery is far better equipped straight out of the box. Yes, it can feel a bit clumsy on the road, but I like that. A 4×4 should feel like an off-roader in my view! 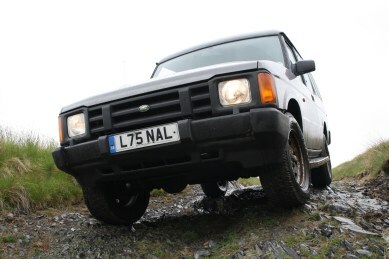 It still handles well and it really is a tribute to the cleverness of Spen King, the man behind the Range Rover of 1970 – and therefore the platform underneath the Discovery of 1989. It isn’t just the ability that impresses though. I find the Discovery a great vehicle to sit in. I love the blue Conran-penned interior and the high driving position. It’s better than the Range Rover, because there’s more headroom. 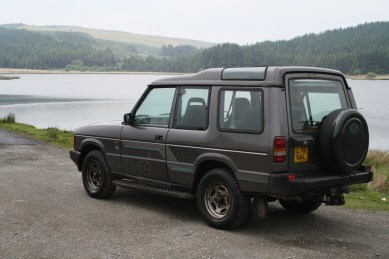 They may share a body structure, but the Range Rover always left me feeling like I’d been squashed against the ceiling. The interior is far, far better than that of my similarly aged Range Rover too. More cohesive and less rattly. Which one was the premium product again?